Our eyes are in constant use during every waking minute. The way we use our eyes can determine how well we work throughout our lifetime. Over 80% of our learning is mediated through our eyes indicating that how much important is our vision. The light rays striking the retina generate potentials in the light receptors; impulses initiated in the retina are conducted to the cerebral cortex, where they produce the sensation of vision. Vision disturbance is a silent adversary that only appears after a long period of continued exposure. In modern life, one of the visually demanding jobs is working with a computer or visual display terminal (VDT). The users of the computer experience visual problems, cumulatively known as Computer Vision Syndrome (CVS). American Optometric Association defines CVS as "complex of eye and vision problems related to near work which are experienced during or related to computer use." CVS occurs when the viewing demand of the tasks exceed the visual abilities of the user. The causes of computer vision syndrome are a combination of individual visual problems, poor workplace conditions, and improper work habits (prolonged work exposure, sitting in non-optimal posture), high concentration, continuous looking at a fixed object, and lesser blinking of eyelids. When one looks at any close object, the eyes perform three simultaneous actions: Contraction of pupil (miosis), accommodation, and convergence. The last two are the most important from the view point of CVS. Convergence occurs when the eyes turn "inward and downward" toward the nose when one views close objects. These inward and downward movements require contractions of extra ocular (Medial Rectus and Superior Oblique) muscles of the eyes and may contribute to eyestrain. , Sheedy (1991) categorized the various symptoms into one of the following groups. The groups are (a) visual symptoms, (b) ocular symptoms, (c) asthenopia (eye strain), (d) photophobia (sensitivity to lights), and (e) musculoskeletal symptoms. Visual symptoms include blurred vision or squinting (constant, intermittent, or when changing viewing distant), frequently losing place and diplopia. Uncorrected refractive error (incorrect far or near vision), accommodation problems, binocular alignment problems, dry eyes are the causes of visual symptoms. On the contrary, ocular symptoms include irritated eyes (itching, burning, dry, aching, or red eyes), excessive tearing, excessive blinking, and contact lens intolerance. Asthenopia includes eyestrain, headaches, and fatigue. Refractive, accommodation, binocular, or illumination problems may lead to asthenopia. In asthenopia, it is often difficult to differentiate the problems due to visual and ocular symptoms. Photophobia includes glare or annoying brightness and flickering sensation. Musculoskeletal symptoms include neck, shoulder, back, wrist, and arm discomforts. 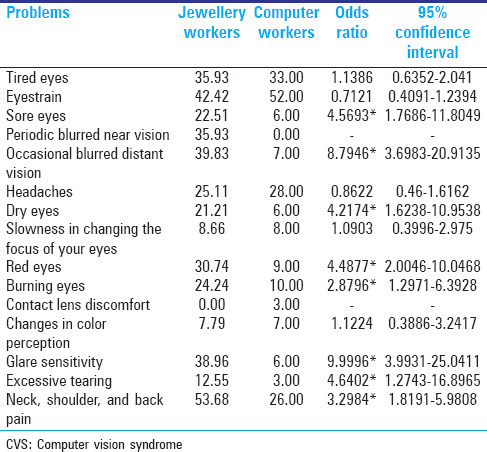 To identify the prevalence of symptoms like Computer Vision Syndrome (CVS) among the workers of the jewellery manufacturing and compare the same with the workers working at computer workstation. To ascertain whether such symptoms have any permanent vision-related problems. Two hundred and thirty young male subjects from the jewellery manufacturing and 100 from an IT-enabled organization were voluntarily participated in this study. The objectives and modalities of the study were discussed at the time of introduction. The participants were informed that they could withdraw themselves at any point of time if they were not comfortable with the experiment. Signed informed consents were obtained from all the participants. Prior permission from the respective manufacturing units and the organizations for conducting the study were also obtained. The study was carried out in Zaveri Bazaar region of Mumbai, one of the jewellery hubs in India and at an IT-enabled organization at Mumbai. Minimum 1 year of work experience on the same job was the inclusion criteria for this study. Head posture, ocular movement, convergence, visual accommodation, fundus, ocular positions were examined by a qualified ophthalmologist for the workers engaged in jewellery manufacturing. Tension of the sclera (intraocular pressure) was measured by tonometer. The check-ups were carried out twice in a day; in the morning before the beginning of the work and in the evening after the completion of the day's work. Since the activity of the jewellery manufacturing involves higher level of visual attention, it was felt that the blinking rate may be lower than that of the normative values available in the literature. In view of the above, blinking rate was measured using a Handycam (Model No. DCR-PC108E-Sony Corporation, Japan). The recording was carried out for 15 minutes. The camera was focused on the workers' eyes to record the blinking of eyes while working. The recorded videos were replayed and using an event marker, numbers of blinking were recorded for the entire period of 15 minutes. Using a stop watch with a recording facility of 1/100 th of a second, eye focus times were also recorded. The study population was the workers engaged in jewellery manufacturing and the workers of an IT-enabled organization. The mean age, height, and weight of the subjects of the jewellery manufacturing were 22.98 (±4.40), 170.88 (±6.32), and 63.58 (±10.03), respectively. The mean age, height, and weight of the participants of the IT-enabled organization were 29.5 (±8.35), 170.31 (±7.23), and 68.47 (±10.98), respectively. The demographic data of the subjects are presented in the [Table 1] and the other results (CVS symptoms, their comparative analysis) are presented in [Table 2] [Table 3] [Table 4] [Table 5] [Table 6] [Table 7] [[Figure 1]]. The results show that the symptoms of the CVS are more prevalent among the jewellery manufacturing workers in comparison to the workers working at IT-enabled organization. Odds ratios (ORs) showed that the symptoms like CVS are higher among the workers of the jewellery manufacturing. Results also showed that the symptoms related to visual, ocular surface, photophobia, and musculoskeletal were significantly higher for these workers. However, the symptoms related to asthenopia did not show any significant difference between the two groups of the workers. The result of ophthalmological tests carried out on jewellery manufacturing workers showed that the fundus condition was normal, the intraocular pressures were found to be within the normal range, and there was no change in the opthalmological condition in the morning and in the evening (92.16% right eye and 95.45% left eye) of the workers engaged in jewellery manufacturing. The result of opthalmogical tests showed that there is no difference between the result of morning and evening for the head posture (OR: 0.585; 95% confidence interval, CI: 01.872-1.8304), ocular position (OR: 0.8106; 95% CI: 0.4138-1.588), ocular movement (OR: 2.0309; 95% CI: 0.2804-14.7086), convergence (OR: 0.885; 95% CI: 0.457-1.714), and visual accommodation (OR: 0.585; 95% CI: 0.288-1.188) among the workers engaged in jewellery manufacturing activity [[Figure 2]]. When one looks at any close object, the eyes perform three simultaneous actions: Contraction of pupil (miosis), accommodation, and convergence. The last two are most important from the view point of development of CVS. Accommodation to a near point occurs when the lens capsule in one's eyes change shape to focus on a close object. This encompasses contraction of ciliary muscles of the eyeball. Convergence occurs when the eyes turn "inward and downward" towards the nose when one views close objects. These require contractions of extra-ocular (Medial rectus and Superior oblique) muscles of the eye. Both of these can contribute to eyestrain. , The work of the jewelry manufacturing is precise. The gold and metal/stone pieces used are very small in size, often difficult to see through naked eyes. These result in higher visual and mental attention. Over and above, while making such jewellery piece, the workers need to place their eyeball in adducted and downward position. As jewellery activities require long duration of exposure and continuous quality checking, the extra-ocular muscles may get tired. The above conditions may be the reason for higher visual discomfort. Many individuals who work at a video display terminal (VDT) reported a high level of job-related complaints and symptoms, including ocular discomfort and muscular strain. The elements of working at a computer which make it visually demanding include frequent saccadic eye movements (ocular motility) and continuous eye focusing (accommodation) and alignment (vergence) demands. Problems occur when the visual demands of the task exceed the visual abilities of the individual to comfortably perform the task. The results of the study showed that the 65.22% workers of the jewellery manufacturing were suffering from the "symptoms like CVS" which was significantly higher than that of the workers engaged in computer work. Eyestrain can be defined and perceived by different people by different ways. The visual science dictionary defines asthenopia or eye strain as the subjective complaints of uncomfortable, painful, and irritable vision. It consists of 24 different types of symptoms based on various causes. Asthenopia can be caused from the problems such as focusing spasm, different vision in each eye, astigmatism, hyperopia (far-sighted), myopia (near-sighted), excess light, voluntary focusing, eye coordination difficulties, and other difficulties. In the jewellery manufacturing, symptoms of eyestrain (42.42%) can be due to longer duration of eye focus time, coordination and lower blinking rate. However, no difference was obtained between the two groups of the workers probably due to similar nature of visual activity (eye focus and coordination). A study carried out by Schlote et al., in 2004 on computer workers had reported the average SEBR after an exposure of 30 minutes was 5.9 ± 4.6. The values are similar to the SEBR values obtained in the present study. Headache is another "discomfort" symptom and is the primary reason most people seek an eye examination. They are also one of the most difficult maladies to diagnose and treat effectively. Visual headaches most often occur toward the front of the head (there are a few exceptions to this), occur most often toward the middle or end of the day, do not appear upon awakening, often occur in a different pattern on weekends than during the work days, can occur on one side of the head more than the other, and other more general symptoms. VDT workers most likely get tension-type headaches. These can be precipitated by many forms of stress, including anxiety and depression; numerous eye conditions, including astigmatism and hyperopia; improper workplace conditions, including glare, poor lighting, and improper workstation set-up. ,,, The result of headache showed that the workers engaged in jewellery manufacturing and computer are not significantly different (OR: 0.8622, 95% CI: 0.4600-1.6162). In the case of workers engaged in jewellery manufacturing, the cause of such headache may be the improper workplace condition, poor lighting, and improper workstation. Anxiety and depression also may be the cause of such headache, but it needs further investigation. The front surface of the eye is covered with a tissue that consists of glands which secrete the tears. These tears cover the eye surface and maintain moisture for normal eye function. The tears also help to maintain the proper oxygen balance of the external eye structures and maintain the optical properties of the visual system. The normal tear layer is cleaned off and refreshed by the blinking action of the eyelids. Blink rates vary with different activities-faster when one is very active, slower during sedate or requires concentration. The size of the eye opening is related to the direction of gaze as one gaze higher, the eyes open wider. The amount of evaporation roughly relates to eye opening, the higher gaze angle. It has been shown that most of VDT users have a reduced average blinking time, and an increased rate of tear evaporation, each of which is a major risk of developing short-term dry eyes. Tests have shown that individuals blink less than half their normal rate when carrying computer work. The result showed that the symptoms of dry eye are 21.21% in jewellery manufacturing is significantly higher (OR: 4.217, 95% CI: 1.623-10.9538) than that of computer workers. This might be because of longer eye focus time. As the result of opthalmological tests showed that the fundus condition is normal and the intraocular pressure for both the eyes comes under the normal range (10-20 mm hg), it can be conclude that there is no permanent effect on the workers' eye condition. Although, it is important to notice that the workers are very young and the mean work experience were 6.73 years (±4.51). It may be assumed that if these conditions continue for the whole working life it may cause permanent disorders. A follow-up study may be required to understand these long-term effects. Nature has designed our visual system to be so dominant that we will alter our body posture to accommodate any deficiency in the way we see. In many office situations, the vision of an employee is compromised and they must adapt their postures to ease the strain on the visual system. These situations will cause obvious physical problems which can be easily remedied with the proper workstation and work environment designs. The present study shows that the workers engaged in jewellery manufacturing are having prevalence of "symptoms like CVS." Although the activities are not technically same as in the case of computer-related jobs but natures of some of the activities are similar. As this study shows that there is vision-related problems (that are similar to the CVS) in jewellery manufacturing, it is recommended that the workplace needs to be modified to enhance the eye health and proper training for eye rest and eye exercise. Blehm C, Vishnu S, Khattak A, Mitra S, Yee RW. Computer vision syndrome: A review. Surv Ophthalmol 2005;50:253-62. Collins CC, O'Meara D, Scott AB. Muscle strain during unrestrained human eye movements. J Physiol 1975;245:351-69. Fisher RF. The force of contraction of the human ciliary muscle during accommodation. J Physiol 1977;270:51-74. Sheedy JE, Harris MG, Bronge MR, Joe SM, Mook MA. Task and visual performance with concentric bifocal contact lenses. Optom Vis Sci 1991;68:537-41. Wood V. Musculoskeletal disorders and visual strain in intensive data processing workers. Occup Med (Lond) 2005;55:121-7. Untimanon O, Pacharatrakul W, Boonmeepong K, Thammagaran L, Leamun N, Taptagapron S, et al. Visual problems among electronic and jewellery workers in Thailand. J Occup Health 2006;48:407-12. Sachdev R, Mathur ML, Haldiya KR, Saiyed HN. Work related health problems in salt workers of Rajasthan, India. Indian J Occup Environ Med 2006;10:62-4. Mao-Jiun JW, Chung-Lun H. Evaluating the eye fatigue problem in wafer inspection. IEEE Trans Semicond Manuf 2004;17:444-7. Soderberg I, Calissendorff B, Elofsson S, Knave B, Nyman KG. Investigation of visual strain experienced by microscope operators at an electronics plant. Appl Ergon 1983;14:297-305. Computer Eyestrain Journal. Available from: http://www.eye2eye.com [Last accessed on 2015 April]. Schlote T, Kadner G, Freudenthaler N. Marked reduction and distinct patterns of eye blinking in patients with moderately dry eyes during video display terminal use. Graefes Arch Clin Exp Ophthalmol 2004;242:306-12. Abdillahi HA, Sourin PD. Epidemiological investigation of workdays lost due to VDT related injuries. Occup Ergonom 1998;1:285-90. Mocci F, Serra A, Corrias GA. Psychological factors and visual fatigue in working with video display terminals. Occup Environ Med 2001;58:267-71. Rempel D, Wilims K, Anshel J, Jaschinski W, Sheedy J. The effect of visual distance on eye accommodation, head posture and vision and neck symptoms. Hum Factors 2007;49:830-8. Patel S, Henderson R, Bradley L, Galloway B, Hunter L. Effect of visual display unit use on blink rate and tear stability. Optom Vis Sci 1991;68:888-92.